World famous diver, Max Bottomtime, has written a 172 page book under the pen name Phil Garner, that spotlights 25 of the best diving locations in and around the Palos Verdes Peninsula. The book is titled Diving The Palos Verdes Penninsula. Some of the locations are regular, well known sites like Malaga Cove, Honeymoon Cove, White Point and Terranea Resort (which the book refers to as Marineland). Included in the book are GPS coordinates to the spots you can only get to by boat; including some of my secret, high producing lobster spots. However, Max does me a favor by NOT stating which places are good for lobster and which aren’t. So, you’ll still need to dive these places and figure out which ones are lucrative for lobster. Be careful however, because about half of Palos Verdes is now a Marine Preserve (as of 2012), so be sure to know where you are first. The book is full of color pictures above and below the water from his many years of diving in the area, along with narration and some maps. There is also an extensive listing of local dive shops. 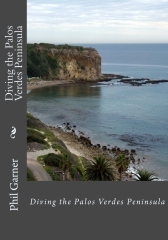 Whether you are new to diving Palos Verdes, or think you know everything about Palos Verdes diving, this book is definitely a good resource. A lot of the local dive shops sell Diving The Palos Verdes Penninsula, or you can buy Max’s book here.